A powerful typhoon has slammed into Japan, killing at least four people. Those who died included a man hit by falling scaffolding, a fisherman tending to his boat, and a young woman whose car was washed away by floodwaters. The storm also forced the cancellation of approximately 350 flights and caused widespread disruption to train services. Typhoon Lan rapidly weakened as it crossed the southeast of the country, but it still produced torrential rain. Shionomisaki, on the southernmost tip of Honshu, reported a staggering 321 millimetres of rain. 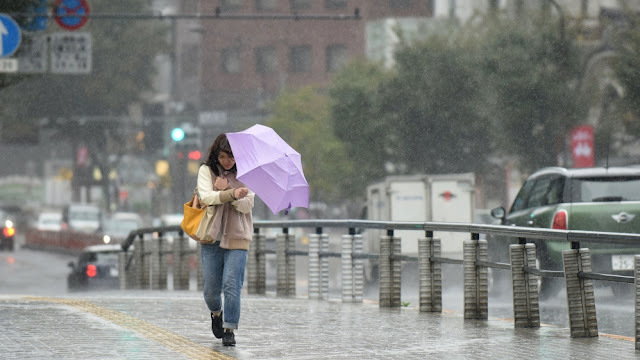 As the rain poured, some 80,000 people in Koriyama were ordered to evacuate their homes. There were concerns that the city, 200 kilometres north of Tokyo, could experience widespread flooding as a river neared the top of its banks, broadcaster NHK said - but fortunately by the afternoon, water levels were starting to fall. Elsewhere in western Japan, homeowners were not so lucky, and several hundred homes were inundated. The storm also generated huge waves, which tossed fishing boats onto the shore. A container ship was stranded after being swept onto a harbour wall, but all 19 crew members escaped injury. The capital, Tokyo, was largely spared the worst of the storm but was still pelted by torrential rain and strong winds. At its peak, Typhoon Lan was a powerful storm with sustained winds of 250 kilometres per hour, the equivalent of a Category 4 hurricane. It weakened to the equivalent of a Category 2 storm before landfall. With gale force winds (at least 62 km/h) extending to approximately 2,220 kilometres, it was one of the largest tropical cyclones on record. Typhoon Lan has now cleared the east coast of Honshu and is disintegrating in the Western Pacific. However, another storm has recently developed to the east of the Philippines. This storm is expected to strengthen rapidly and follow a similar track to Typhoon Lan.